March is National Nutrition Month – Drink Healthy Chocolate Mayesa! March is National Nutrition Month, and healthy chocolate Mayesa drinks fit right in! Mayesa is packed with great nutrition, starting with organic cacao – the purest form of chocolate. This is blended together with such things as pea protein and rice, along with special spices, for an unusually indulgent nutritional source. And that’s just the beginning of the amazing nutrition of Mayesa. Here’s more: Mayesa contains no cholesterol and no trans fats. 3. Iron – 314% of RDA of Iron per ounce serving. Nutritional Bonus! Mayesa is dairy-free, gluten-free,soy-free, and VEGAN! Isn’t it great to have a way of making sure you get great nutrition on a daily basis, and indulge in healthy chocolate at the same time? Can’t beat it! National Nutrition Month is an annual campaign sponsored by the Academy of Nutrition and Dietetics to promote nutrition awareness and education. 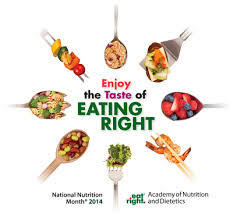 It originated in 1973 as “National Nutrition Week” and expanded to the month-long observance in 1980 in response to growing public interest in nutrition. The theme changes each year, but it always focuses on the importance of making informed food choices and developing sound eating and physical activity habits. This year’s theme, “Eat Right with Color,” provides an easy way to focus on improving eating habits — simply include plenty of color on your plate. And the rich brown of healthy organic cacao is a great color to add to your nutritional palette! Comments Off on March is National Nutrition Month – Drink Healthy Chocolate Mayesa!